Today, Barnes & Noble updated its dedicated e-reader, the Nook, and it did so in great fashion at an event at the company's Union Square, New York, store. The company is the second of the four major e-reader hardware makers to announce an update this week; yesterday, Kobo announced its Kobo eReader Touch Edition. The big news about Barnes & Noble's new Nook--which, like the Amazon Kindle, maintains the same name in spite of a complete redesign--is that the device eschews the original year-and-a-half-old Nook's clunky LCD navigation screen for an E-Ink display. The Nook now is all E-Ink screen, and its compact size reflects that shift. Where the original Nook's weight and size made it bulky and unwieldly, the new Nook's specs are encouraging. It weighs 7.48 ounces, which is 35 percent lighter than the original Nook. It's also more compact--it's 6 percent thinner and more than an inch shorter the first Nook. It now measures 6.5 by 5.0 by 0.47 inches. Battery life is notably up: Barnes & Noble says the Nook can last up to 2 months on a single charge, with the Wi-Fi turned off. The new Nook uses a 6-inch E-Ink Pearl display, the same 800-by-600 pixel display that Amazon and Sony integrated last summer and fall, respectively, and the same display as in Kobo's eReader Touch Edition. Like the Kobo, the Nook uses Neonode's Zeforce infrared touch layer to provide a touchscreen interface. With Barnes & Noble joining the touch party, that leaves only Amazon as the last of the e-readers not using a touchscreen design. The E-Ink Pearl display improves contrast and page-turn speed as compared with the now-antiquated E-Ink display on the original Nook. The front face of the new Nook has no obvious buttons; but the lowercase "n" in the "nook" logo serves as a button on the front, and paging buttons are built into the side (you can also turn pages simply by using the touch interface). The front face has a wide bezel that's a charcoal gray, similar to Amazon's Kindle. During the unveiling, Barnes & Noble made a big deal of noting that the Nook has 37 fewer buttons than the Kindle, a clear reference to Amazon's continuing reliance on a keyboard. Interestingly, the new Nook runs Android 2.1 (same mobile OS as the original Nook and Nook Color originally shipped with) and has 802.11 b/g/n Wi-Fi, with free Wi-Fi access at all Barnes & Noble stores and at AT&T hotspots nationwide; but there was no mention of a 3G variant. 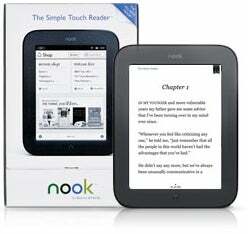 The Nook has 2GB of built-in storage, and a microSDHC card slot for additional storage. Its redesigned interface integrates B&N's Nook Friends social connection, something that also originated on Nook Color. Nook supports ePub and PDF files and JPEG, GIF, PNG, and BMP image files. The new Nook is priced at $139 and is available for preorder from the B&N Website now, with shipping to start June 10th. Or look for it in stores at Barnes & Noble, Best Buy, Walmart, Books-A-Million, and Staples.